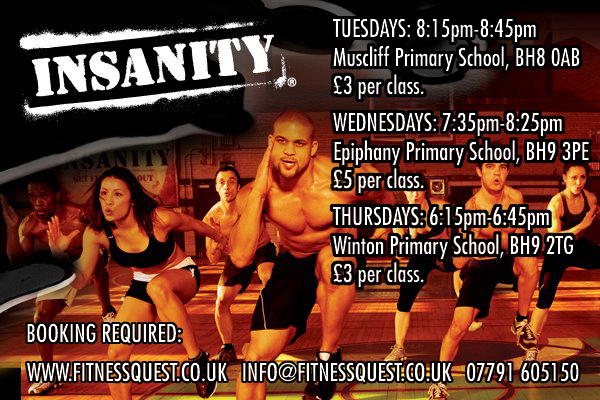 Fitness Quest Personal Training & Classes Bournemouth: April INSANITY - Incredible Spring OFFER, just £1.67 per class! April INSANITY - Incredible Spring OFFER, just £1.67 per class! The sun has been shining this week and it feels as if Spring is well and truly on it's way - Hurrah! With the lighter evenings just around the corner and the demand for those Summer bodies imminent I've decided to offer you a cracking deal on my INSANITY classes - 9 sessions for just £15! What is INSANITY and who can do it? 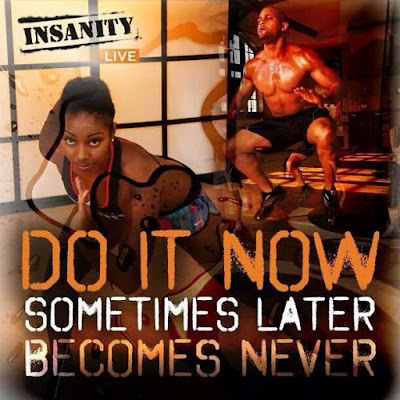 Insanity is one of the best known fitness brands, mainly because of it's popularity as the successful at home, workout DVD. However, INSANITY has evolved a lot since the launch of the live classes, making it adaptable for ALL fitness levels. 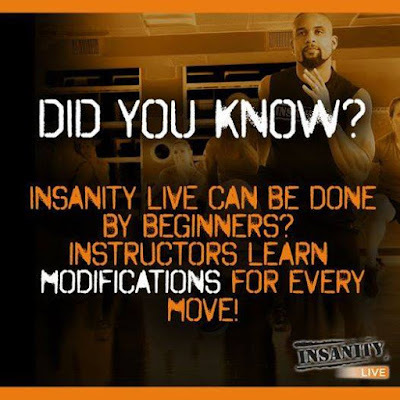 Don't get me wrong, it's still a tough class but with the additions of modifications for all exercise and a qualified trainer (me) to help you get through the session; you have nothing to worry about (unless you want a challenge)! You only work to your ability, and I always advise during your first session you use the modifications available and get used to the exercises and format, including when you get breaks. Each exercise is performed 3 times during the session, so if you didn't work hard enough first time, there's always the second or third set, or even next week! 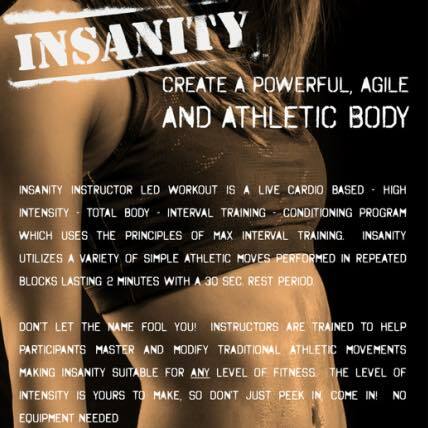 I run the INSANITY rounds for a duration of 5-6 weeks, this allows each participant the opportunity to get used to the exercises, progress, and then push as hard as they can as each week goes by. Then once it starts feeling a bit easier, I change it up, always keeping you on your toes and challenging different muscle groups. I get a wide variety of participants at class, there are many mums there who have various goals from shifting the baby weight to marathon training, there are men too, and people of all ages join in (over 18's only). If you do have any injuries or medical conditions please let me know though, before class so that I can explain any exercises that might not be safe for you, and what you can do instead. Even if you can't attend every session this is still a great offer, firstly because you'll be saving a total of £18, secondly because signing up to classes in advance gets better results through better commitment (you've paid so you'll go), and finally this offer coincides with the start of two brand new rounds! Tuesday and Wednesday will be on round 17 and Thursday will be on round 16! If you'd like to claim this offer, be quick as there are limited places: click here to book. If you have any questions or concerns please get in touch via email and I'll be happy to help.